As people stop by our home this winter and see the trays of lush-looking grass, “what'cha growing there?” is the first question out of their mouths. It is lovely – thick, green grass. Eight trays on a shelf – each one in a different stage of growth. We stumbled onto the idea, really. Looking through a farm products magazine, here was an ad for a machine to grow “fodder”. Fodder – I had never heard of it, but it looked intriguing. Cattle, horses, chickens – farm animals that you could feed with fodder. After a bit of searching on the Internet, I was convinced that I should give it a try. We had a big barrel of hard red winter wheat seed, so I grabbed a couple of cups and put it in a bucket to soak overnight. The next day, I took those soaked seeds, poured them into a seed tray (you know the kind you get when you buy your annual flowers in the spring) and put the next batch in a bucket to soak. 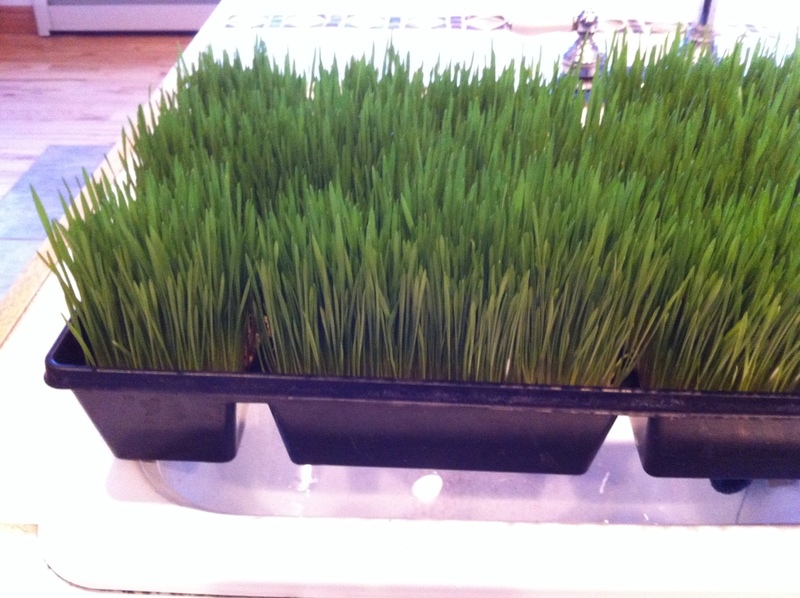 At about day three, the wheat seeds were sprouting and by day four, the sprouts were turning green! I had read that the sprouts were at their “nutritional best” at day eight. I could hardly wait for the sprouts to be ready to feed! On the big day, I proudly took a bag full to the chicken coop and set them out to be eaten. The girls walked around staring at the sprouts – maybe it had something to do with the fact that it was the middle of winter and they hadn't seen anything green for a few months – but they looked pretty darned suspicious of the whole thing! After about five minutes, one brave soul walked up and took a little peck at them. Then another. 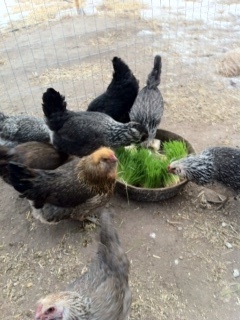 Well, the others followed suit, and in no time, they were all happily munching away on the sprouts. Next I started some black oil sunflower seeds for the chickens. 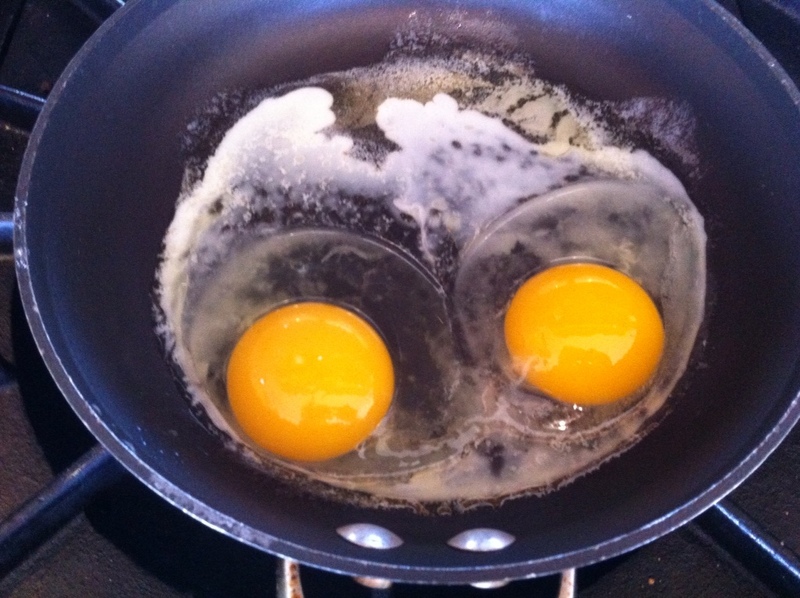 They seem to take a bit longer to sprout and grow, but the happy chickens meet me with open wings! 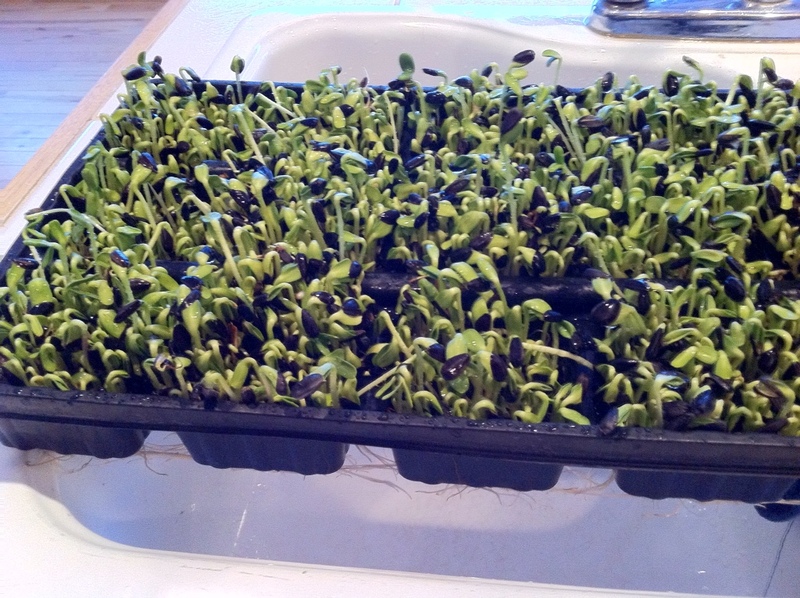 I spend about 10-15 minutes each morning spraying the sprouts with water and getting the next batch of seeds soaking. Not a big price to pay for those beautiful farm-fresh eggs. When spring does arrive, the chickens will be happy to tear around the greenhouse and garden again, but until then, they seem very content to eat the greens!